Why hasn’t wealth inequality improved over the past 50 years? And why, in particular, has the racial wealth gap not closed? These nine charts illustrate how income inequality, earnings gaps, homeownership rates, retirement savings, student loan debt, and lopsided asset-building subsidies have contributed to these growing wealth disparities. This story was updated with new data on October 5, 2017. Source: Urban Institute calculations from Survey of Financial Characteristics of Consumers 1962 (December 31), Survey of Changes in Family Finances 1963, and Survey of Consumer Finances 1983–2016. Notes: 2016 dollars. 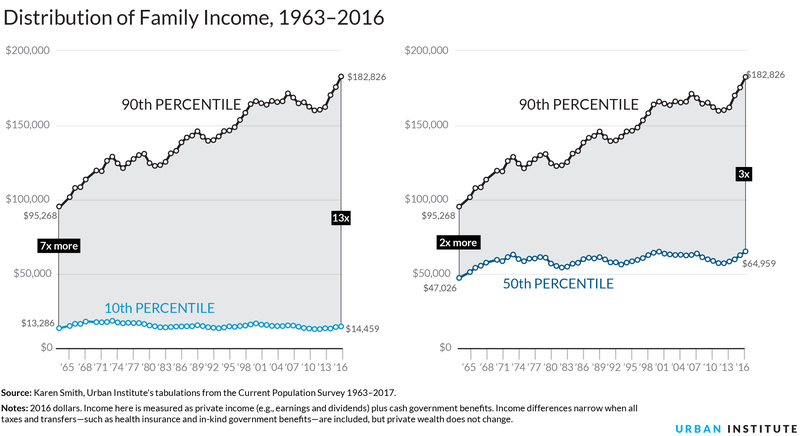 No comparable data are available between 1963 and 1983.
and the wealth of those at the 99th percentile—in other words, those wealthier than 99 percent of all families—grew sevenfold. These changes have increased wealth inequality significantly. In 1963, families near the top had six times the wealth (or, $6 for every $1) of families in the middle. By 2016, they had 12 times the wealth of families in the middle. Sources: Karen Smith, Urban Institute's tabulations from the Current Population Survey 1963–2017. Notes: 2016 dollars. Income here is measured as private income (e.g., earnings and dividends) plus cash government benefits. Income differences narrow when all taxes and transfers—such as health insurance and in-kind government benefits—are included, but private wealth does not change. Income is money coming into a family, while wealth is a family’s assets—things like savings, real estate, businesses—minus debt. Both are important sides of families’ financial security, but wealth cushions families against emergencies and gives them the means to move up the economic ladder. Also, wealth disparities are much greater than income disparities: three times as much by one measure. Income inequality can worsen wealth inequality because the income people have available to save and invest matters. Focusing on private income, such as earnings and dividends, plus cash government benefits, we see that the income of families near the top increased roughly 90 percent from 1963 to 2016, while the income of families at the bottom increased less than 10 percent. Median wealth by race and ethnicity is lower than average wealth, but the trends stay the same. Both measures are important because average wealth indicates how a group is prospering as a whole relative to other groups, while median wealth shows how the “typical” family is doing. Notes: 2016 dollars. No comparable data are available between 1963 and 1983. Black/Hispanic distinction within nonwhite population available only in 1983 and later. 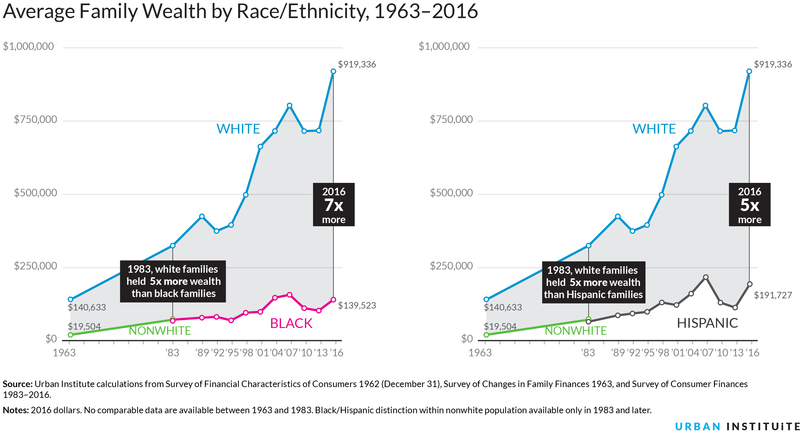 Families of color will soon make up a majority of the population, but most continue to fall behind whites in building wealth. In 1963, the average wealth of white families was $121,000 higher than the average wealth of nonwhite families. 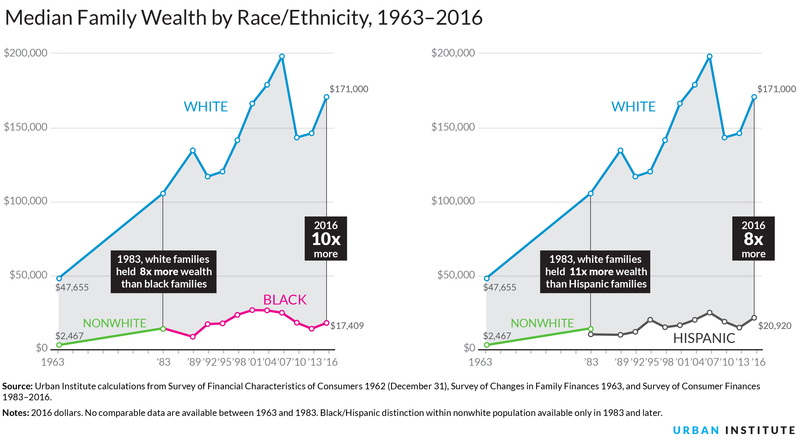 By 2016, the average wealth of white families ($919,000) was over $700,000 higher than the average wealth of black families ($140,000) and of Hispanic families ($192,000). Put another way, white family wealth was seven times greater than black family wealth and five times greater than Hispanic family wealth in 2016. Despite some fluctuations over the past five decades, this disparity is as high or higher than was in 1963. Source: Urban Institute calculations from Survey of Consumer Finances 1983–2016. Notes: 2016 dollars. Hispanic sample size too small to show. Age is defined as the age of the household head. In 2016, these people were ages 65–73; in 1983, they were ages 32–40. White families accumulate more wealth over their lives than black or Hispanic families do, widening the wealth gap at older ages. In their 30s, whites have an average of $147,000 more in wealth than blacks (three times as much). By their 60s, whites have over $1.1 million more in average wealth than blacks (seven times as much). Median wealth by race is lower. 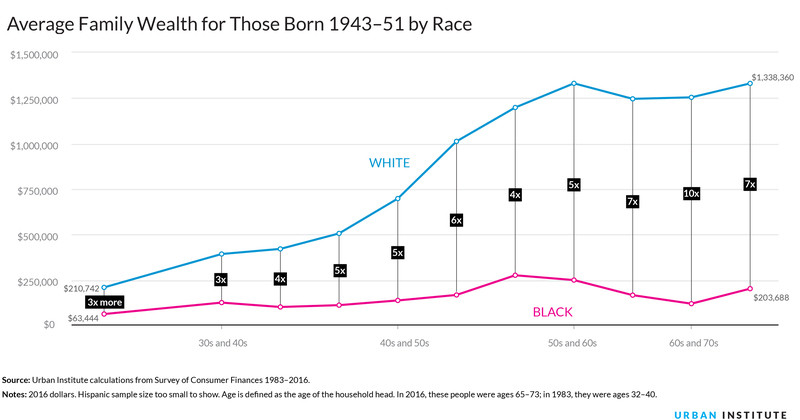 Though the dollar gap grows with age, the ratio doesn’t grow in the same way: whites have seven times more median wealth than blacks in their 60s and 70s. Source: Melissa Favreault, Urban Institute's tabulations from the 2008 Survey of Income and Program Participation matched to Summary Earnings Records through 2012. Notes: 2015 dollars. These people are ages 58–62 in 2012. Excludes people outside US for more than 10 years of adulthood; this is especially important for Hispanics, who are more likely foreign born. Why is the racial and ethnic wealth gap so big? People with lower earnings may have a harder time saving. The average white man earns $2.7 million over a lifetime, while the average black man earns $1.8 million and the average Hispanic man earns $2.0 million. The difference in lifetime earnings is lower for women: the average white woman earns $1.5 million, while the average black woman earns $1.3 million and the average Hispanic woman earns $1.1 million. These disparities partly reflect historical disadvantages that continue to affect later generations. Source: Urban Institute calculations from Current Population Survey 1976–2017. 1976–2014 values from Census Historical Household Surveys, Table HH-5. 2015–16 values from Census Annual Statistics 2016, Table 22. 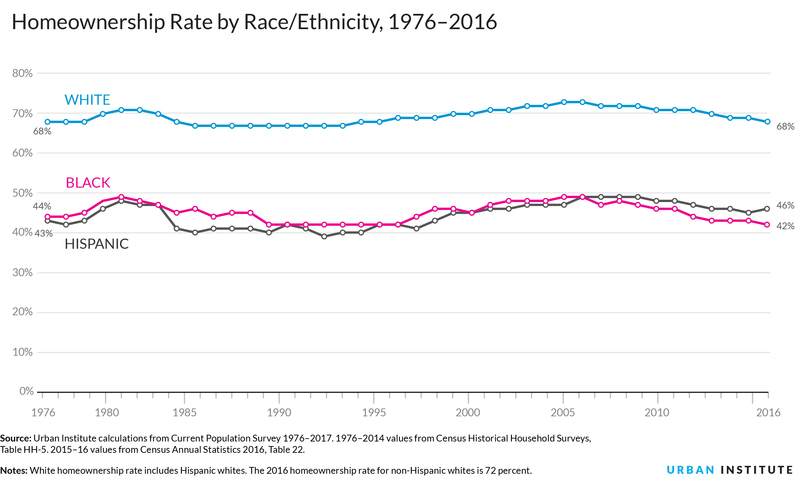 Note: White homeownership rate includes Hispanic whites. The 2016 homeownership rate for non-Hispanic whites is 72 percent. Blacks and Hispanics are less likely to own homes, so they more often miss out on this powerful wealth-building tool. Homeownership makes the most of automatic payments—homeowners must make mortgage payments every month—to build equity. In 1976, 68 percent of white families owned their home, compared with 44 percent of black families and 43 percent of Hispanic families. By 2016, the homeownership gap had narrowed slightly for Hispanics but widened for blacks. Black and Hispanic families were also less likely to own homes than white families with similar incomes. Source: Urban Institute calculations from Survey of Consumer Finances 1989–2016. Notes: 2016 dollars. Liquid retirement savings include dollars in accounts such as 401(k), 403(b), and IRAs. Median liquid retirement savings for black and Hispanic families were zero from 1989 to 2013. 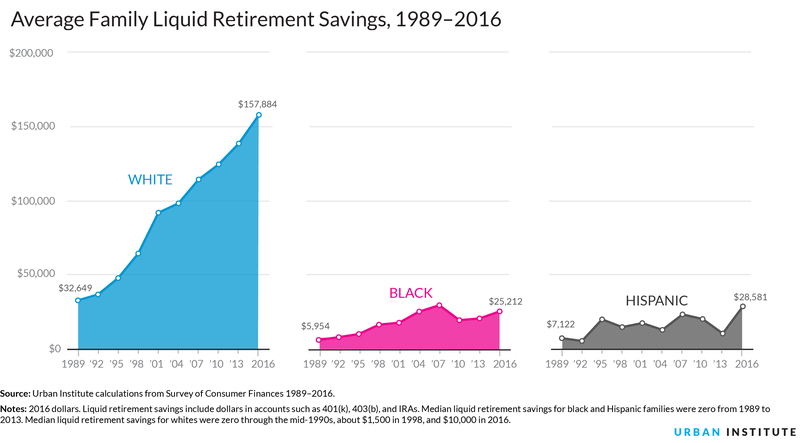 Median liquid retirement savings for whites were zero through the mid-1990s, about $1,500 in 1998, and $10,000 in 2016. In 2016, white families had about $130,000 more (or six times more) in average liquid retirement savings than black and Hispanic families. 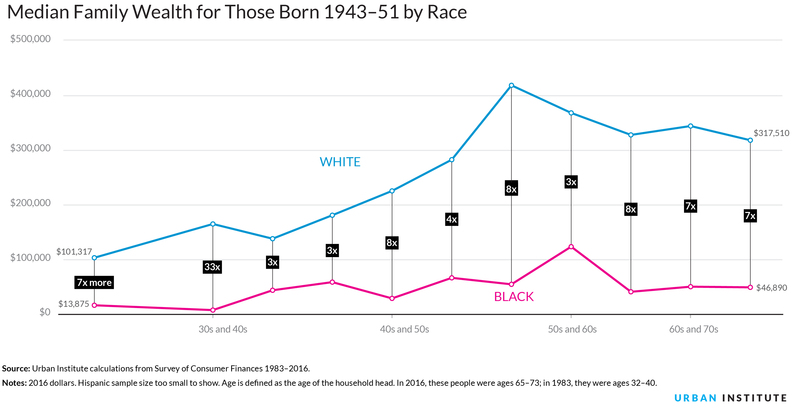 In sheer dollar terms, this disparity has increased more than fivefold over the past quarter-century: in 1989, white families had about $25,000 more (or five times more) in average retirement savings than black and Hispanic families. This gap is becoming more important as liquid retirement savings vehicles, like 401(k)s, replace more traditional defined-benefit pension plans. Why does this gap exist? It’s not just income differences; even at the same income level, gaps remain. Black and Hispanic families have less access to retirement saving vehicles and lower participation when they have access. But lower access and participation isn’t the full story. Black workers are somewhat less likely to participate in employer retirement plans than white workers (40 percent versus 47 percent in 2013, respectively) but have much lower average liquid retirement savings. This suggests that simply having more employers offer retirement plans will not be enough to close the gap, especially if lower-income groups contribute smaller portions of their income to retirement plans and are more likely to withdraw money early to cover financial emergencies. Lower-income families may also get lower returns on average if they invest in safer, shorter-term assets. Notes: 2016 dollars. Age is defined as the age of the household head. Since the mid-2000s, black families, on average, have carried more student loan debt than white families. 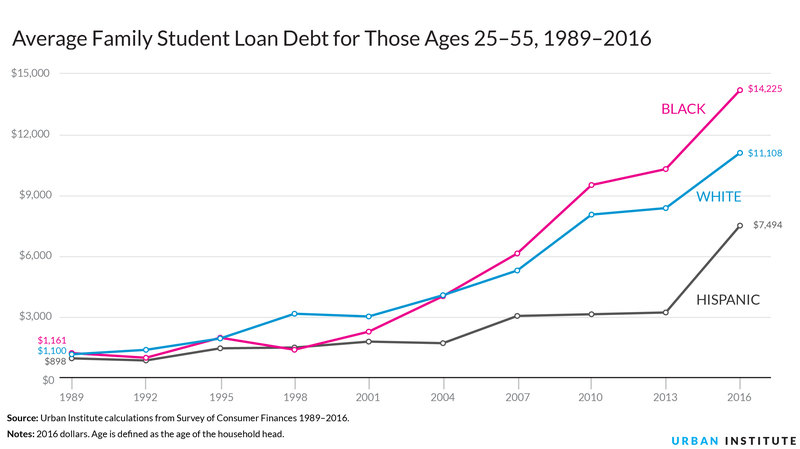 This is driven in large part by the growing share of black families that take on student debt. In 2016, 42 percent of families headed by black adults ages 25 to 55 had student loan debt, compared with 34 percent of similar white families. Because black families, on average, have less wealth and fewer private resources, they may be more likely to turn to loans to finance their education. White families are five times more likely than black families to receive large gifts or inheritances, which can be used to pay for college. However, black students also have lower graduation rates than white students. 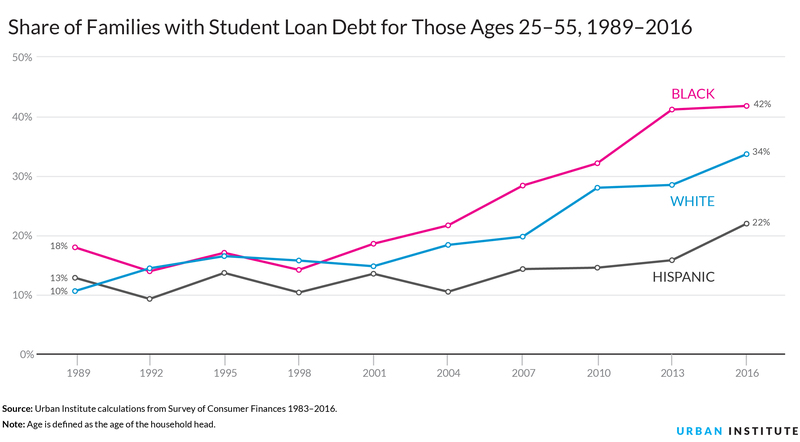 Student loan debt doesn’t always translate into a degree that promotes economic mobility—and income and wealth—in the long run. Source: Updated estimates from Steuerle et al. (2014). Note: “Income” refers to the Tax Policy Center’s “expanded cash income” measure, which is described in Rosenberg (2013). 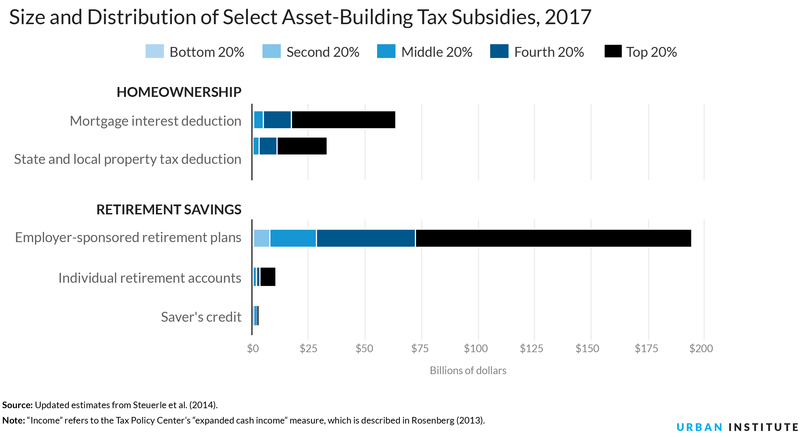 The federal government spends over $400 billion to support asset development, but those subsidies primarily benefited higher-income families—exacerbating wealth inequality and racial wealth disparities. About two-thirds of homeownership tax subsidies and retirement subsidies go to the top 20 percent of taxpayers, as measured by income. The bottom 20 percent, meanwhile, receive less than 1 percent of these subsidies. Blacks and Hispanics, who have lower average incomes, receive much less of these subsidies than whites, both in total amount and as a share of their incomes. Low-income families benefit from safety net programs, such as food and cash assistance, but most of these programs focus on income—keeping families afloat today—and do not encourage wealth-building and economic mobility in the long run. What’s more, many programs discourage saving: for instance, when families won’t qualify for benefits if they have a few thousand dollars in assets or when they have to give up rent subsidies to own a home. Limit the mortgage interest tax deduction and use the revenues to provide a credit for first-time homebuyers. Establish automatic savings in retirement plans. Reduce reliance on student loans while supporting success in postsecondary education. Offer universal children's savings accounts. Reform safety net program asset tests, which can act as barriers to saving among low-income families. Provide subsidies to promote emergency savings, such as those linked to tax time. By more efficiently and equitably promoting saving and asset building, more people will have the tools to protect their families in tough times and invest in themselves and their children. * This chart title was updated on Oct. 24, 2017, to reflect the full range of years presented in the chart. The nonprofit Urban Institute is dedicated to elevating the debate on social and economic policy. This interactive was funded by the Ford Foundation, with additional support from the Annie E. Casey Foundation. The views expressed are those of the authors and should not be attributed to the Urban Institute, its trustees, or its funders. Funders do not determine research findings or the insights and recommendations of our experts. More information on our funding principles is available here. Read our terms of service here. The team thanks Melissa Favreault, Karen Smith, and Philip Stallworth for special tabulations, Hannah Hassani for research assistance, and Opportunity and Ownership seminar participants for helpful comments. Copyright © February 2015. Urban Institute. View this project on Github.